One of the things I love about making Oreo truffles is how easy they are to make. 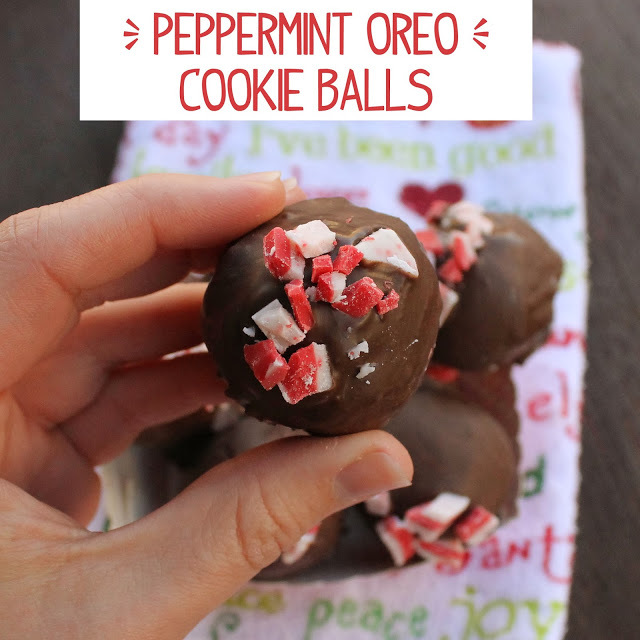 You can take pretty much any flavor Oreo and create a little dessert out of it! 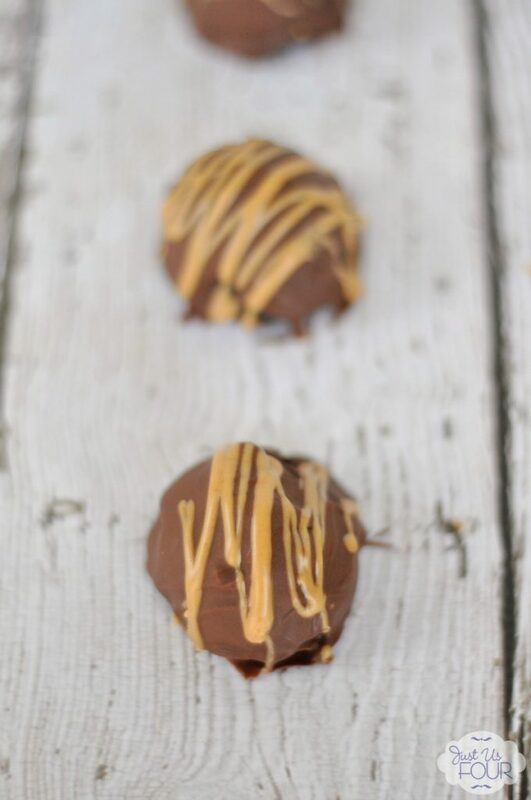 These peanut butter Oreo truffles are by far my favorite to date though because they combine my two absolute favorite things into one little ball of deliciousness. 1) Add the cookies to a food processor and pulse until they are well crushed. Add cream cheese and salt and pulse until combined. Stir with a spoon once or twice to be sure it is well mixed. 2) Line a large cookie sheet with parchment paper. 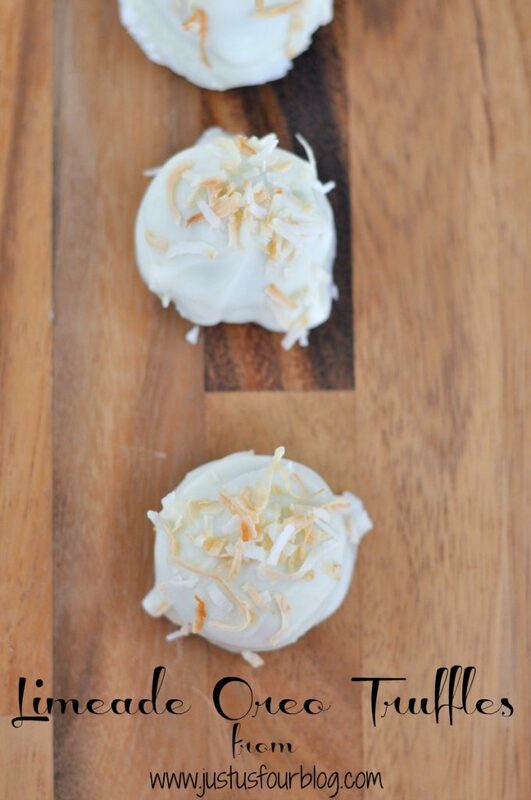 Using a cookie dough scooper or similar, drop rounded tablespoons full of cookie mixture onto the cookie sheet. Refrigerate for at least 15 minutes. 3) Melt chocolate chips in the microwave in 30 second intervals, stirring in between each interval, until smooth. 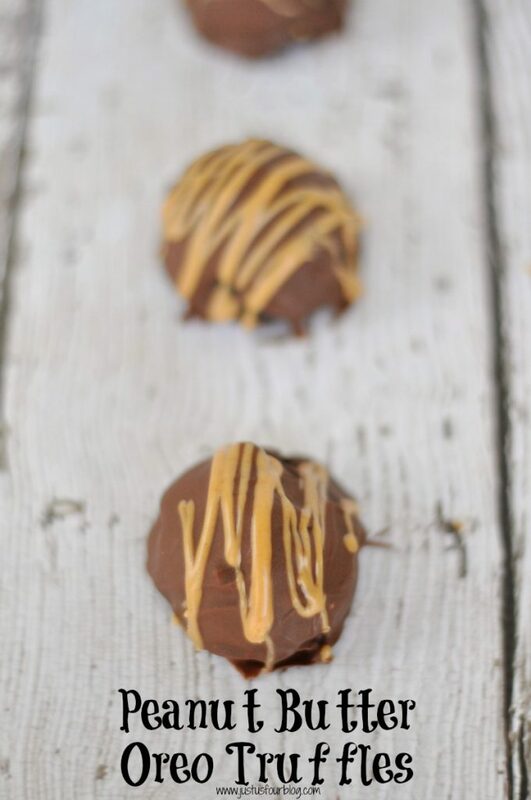 Dip cookie balls into chocolate mixture and return to parchment paper. 4) Heat peanut butter for 10 – 15 seconds. Drizzle over the top of the truffles. Refrigerate until ready to eat. 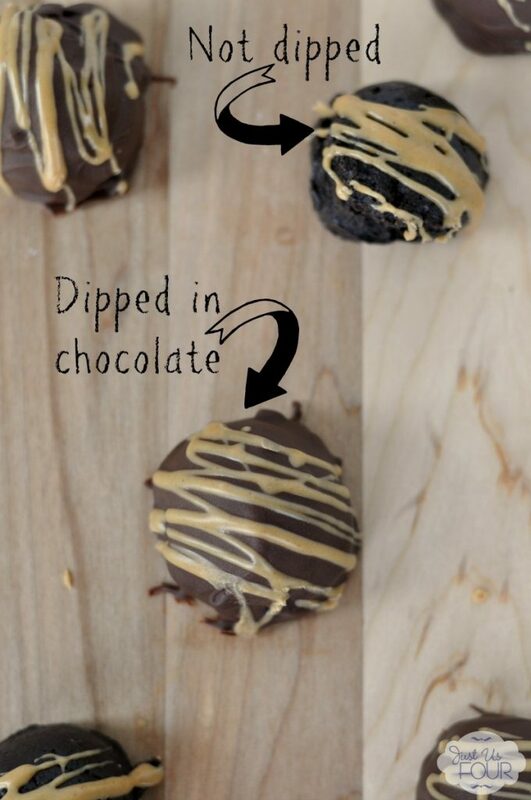 If you don’t want the extra chocolate from dipping them, you can totally skip that step too. I told you these truffles were amazing. 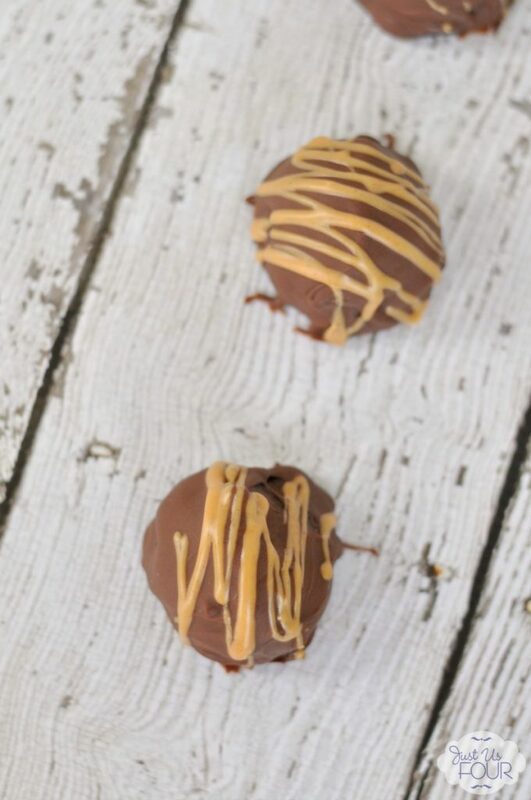 How could peanut butter and chocolate not taste like heaven? Add the cookies to a food processor and pulse until they are well crushed. Add cream cheese and salt and pulse until combined. Stir with a spoon once or twice to be sure it is well mixed. Line a large cookie sheet with parchment paper. Using a cookie dough scooper or similar, drop rounded tablespoons full of cookie mixture onto the cookie sheet. Refrigerate for at least 15 minutes. Melt chocolate chips in the microwave in 30 second intervals, stirring in between each interval, until smooth. 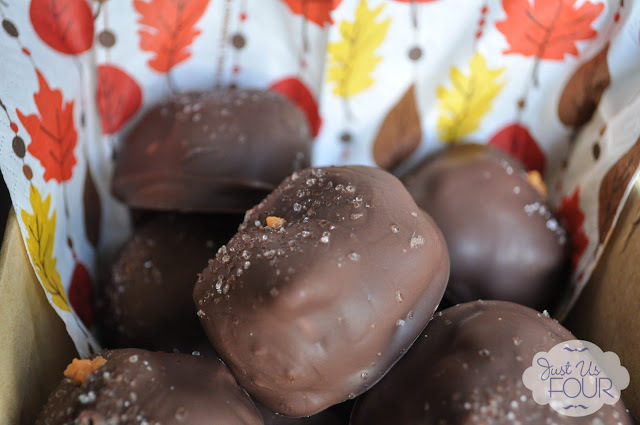 Dip cookie balls into chocolate mixture and return to parchment paper. Heat peanut butter for 10 - 15 seconds. Drizzle over the top of the truffles. Refrigerate until ready to eat.